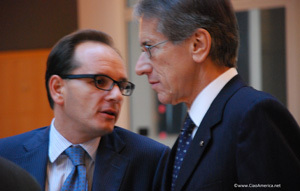 January 20, 2011 ~ Italy's Ministry of Foreign Affairs announced today that Giuseppe Manzo, press attache at the Italian Embassy in Washington, has been appointed head of the Ministry's press office, as well as spokesman for Minister Giulio Terzi di San'Agata. Manzo, 44, is a career diplomat who has served twice in Washington, first in 1998-2002, and again starting in 2009. From 2005-2009, Manzo was press attache at Italy's mission to the U.N. in New York, where Terzi was the permanent representative. When Terzi became Italy's Ambassador to Washington, Manzo joined him as press attache in the nation's capital. During Manzo's tenure the press office increased its outreach to the Italian and U.S. media and to the Italian American community at large.